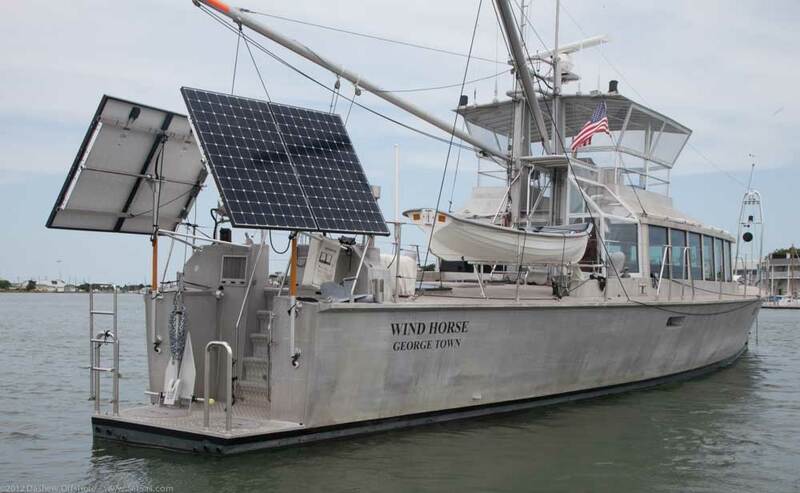 Since launching, Wind Horse has comfortably chauffeured us well over 50,000 miles.. through the tropics, to the ice pack of the high Arctic beyond 80 degrees North and along the Intra Coastal Waterway. She has done this with a minimum of fuss, little maintenance, at a fraction of the cost we were used to before. 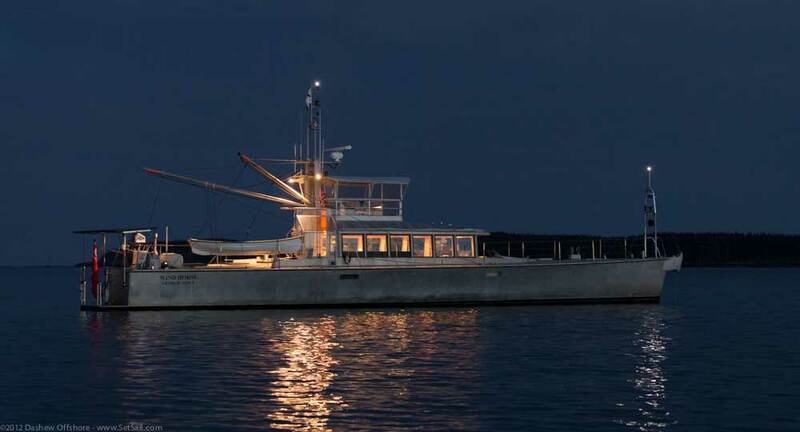 We consider her to be our perfect cruising yacht. But we are afflicted with what is known as the perfectionist disease and are genetically predisposed towards tinkering, cannot leave well enough alone – hence this recap of the past year’s modifications and preventative maintenance schedule. This is a long post, so settle in gentle reader. There are several major events that require comment. 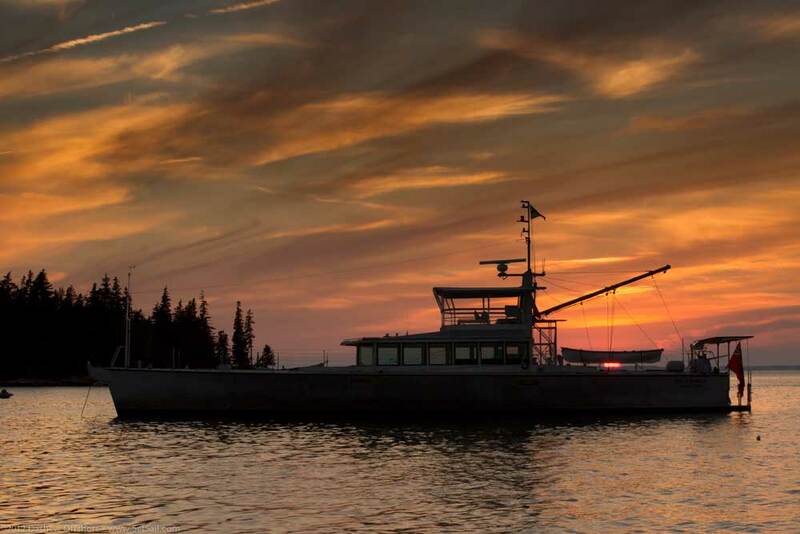 These include our very positive experience with the newest high efficiency solar panels, enclosure of the flying bridge with “Ever Clear” windows, a new engine exhaust, the addition of a N2K system, along with a thorough 6000 hour check and of all systems onboard. We’ll start with the flying bridge. This represents the biggest and most positive mod to the boat since launching, and completely changes how we use Wind Horse (and will influence where she goes as well). 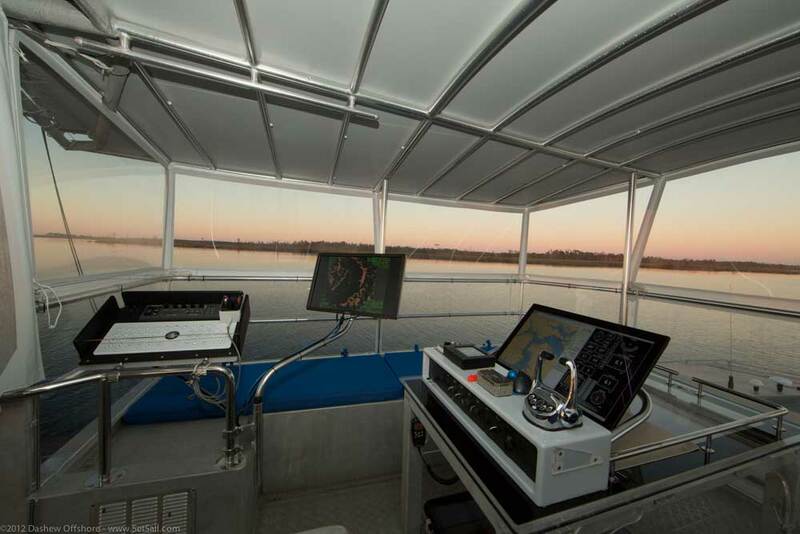 There is a complete suite of electronics available to the watch stander on the flying bridge, a favored location due to the sight lines. 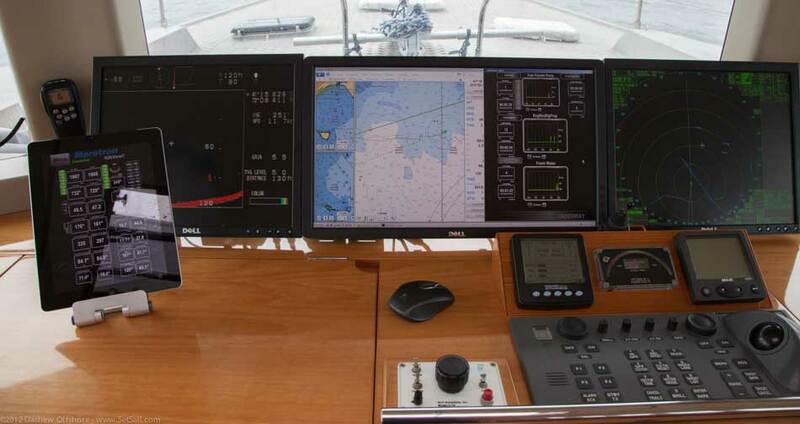 Radar, sonar, charting software, and Maretron N2K View are all right at hand. 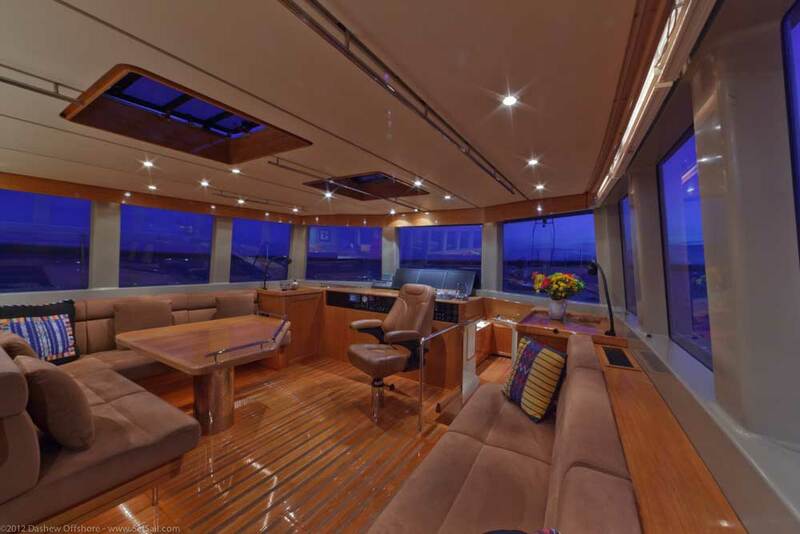 Whether piloting in fog, rain, or bright sunshine, visibility through the Ever Clear windows is remarkable, and much better than looking through the 19mm/ .75″ glass windows which surround the great room. 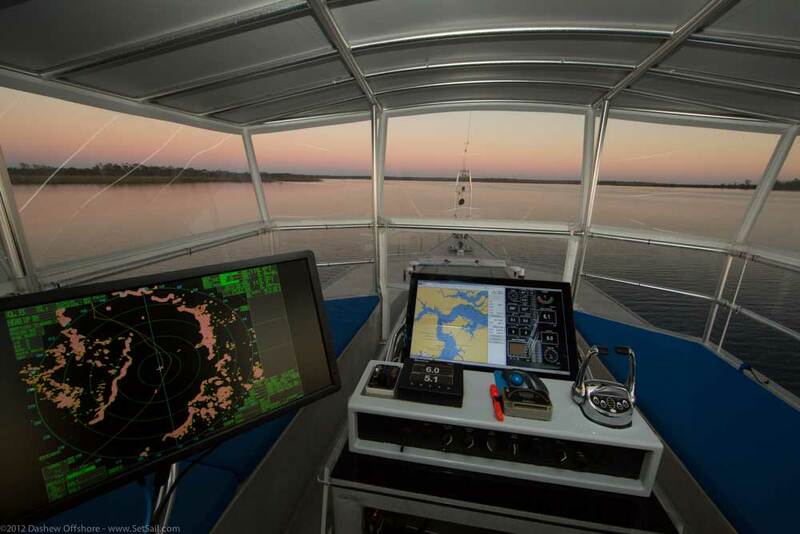 The scuttle is a handy surface for charts and nav aids, cameras, and a favorite spot to sit when on a long watch. 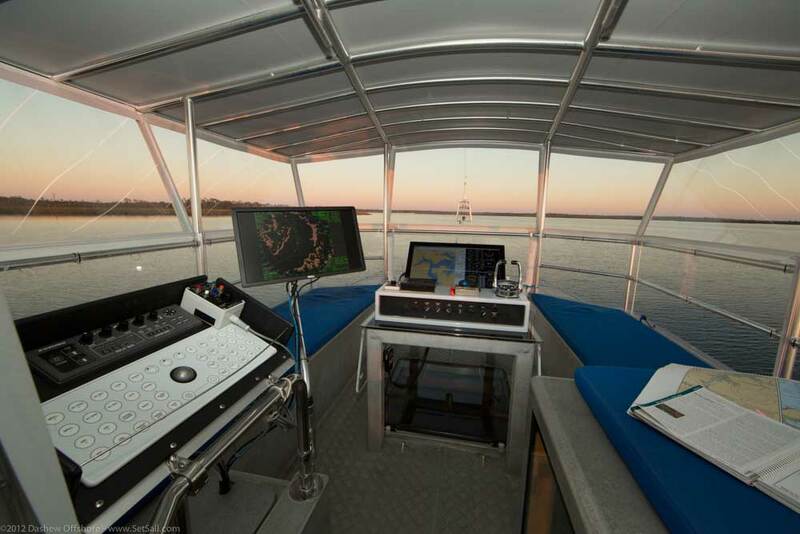 Having the radar and sonar control panels at our side, and the radar/sonar monitor on a swing arm, has worked out well. 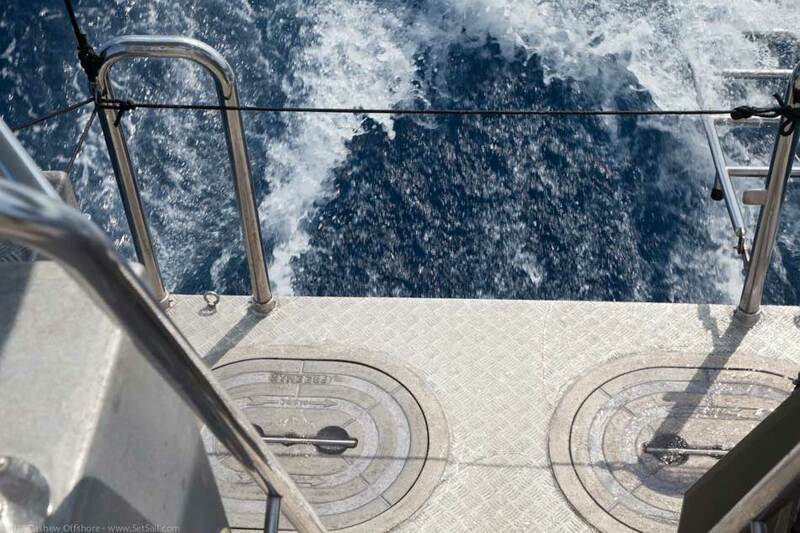 The swing arm monitor position can be optimized for standing at the helm when conning, for optimal viewing when seated on the scuttle top keeping watch, or out of the way if we are at anchor and just relaxing. Likewise with the main monitor at the table. It can be rotated up so it is easiest to see when seated on the scuttle, or laid flat in port out of sight when entertaining. 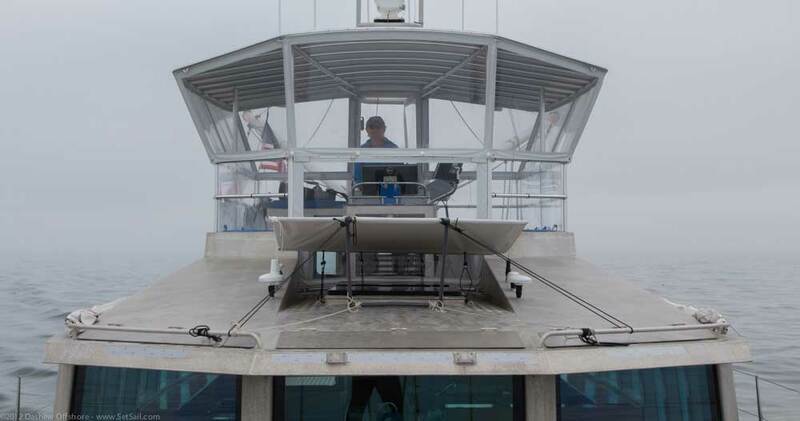 The flying bridge is getting a lot more use at anchor too now that it is enclosed. 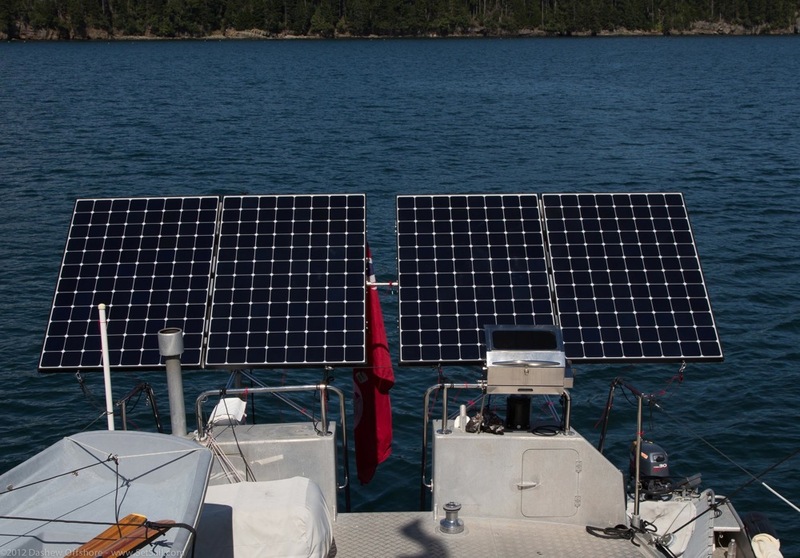 The addition of this solar panel array is another Eureka moment in our cruising experience. These Sunpower 320 Watt panels have generated as much as 5.4kW hours of energy in half a day, with the average being between 6 and 7.5 kWh for full days during our sojourn in Maine this past summer. We have seen as much as 60 amps at 24.8 VDC from the 4 panels, a truly astonishing amount of power. The daily output is typically sufficient to cover 75% or more of our power needs. If the big iMac computer with its array of external hard drives is not being used, then the solar panels provide for all our energy needs at anchor on nice days. The practical and emotional impact of this is not to be underestimated. 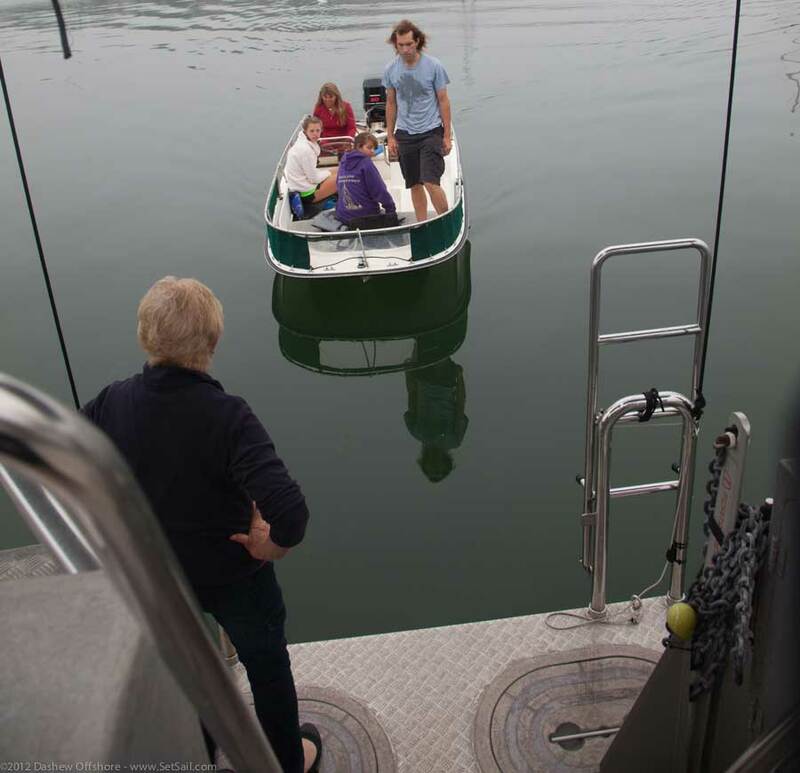 The system used to tilt, rotate, and store the panels before coming into a dock is easy to operate, requiring under 5 minutes for the full cycle. We should probably make a few comments on lighting at this juncture. We have been watching the development of LED interior lights with interest, and at owner request, have begun to fit these to a few of our builds. Our approach in the past has been driven by a tradeoff between color temperature (i.e. harsh or soft light color) and power consumption. The LEDs are efficient on the latter, but deficient with the former. Now that solar power is in the equation there is even less incentive for us to switch. The one area we have employed LED lighting is for our bow spotlight, replacing the previous massively large and power hungry conventional fixture. The LEDs shown here, 6 of them, take very little power, and can be run at anchor without using the inverter or worrying about battery drain. 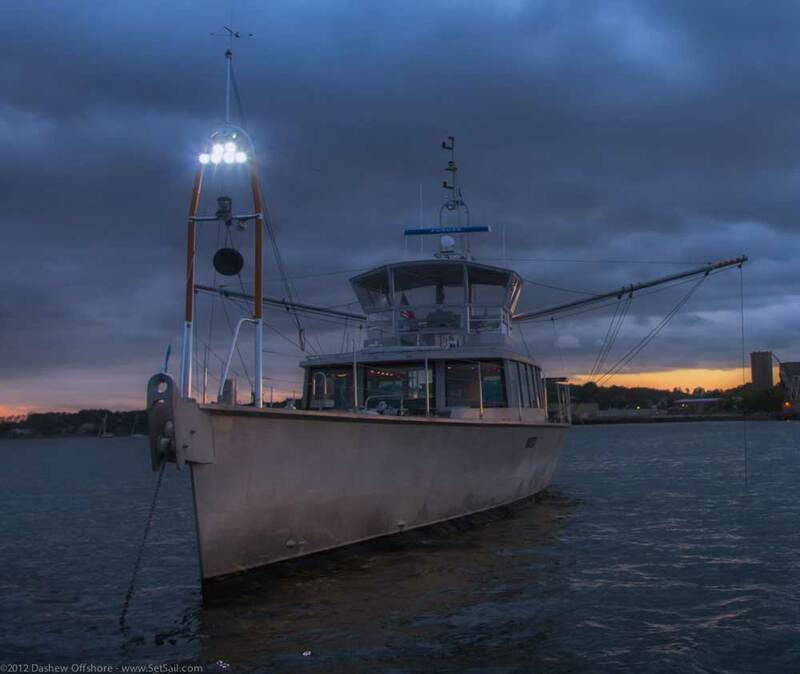 Driven by the need to get some real world cruising experience living with the N2K data system, we installed a basic Maretron NMEA 2000 buss and tied a few items into it to get our feet wet. 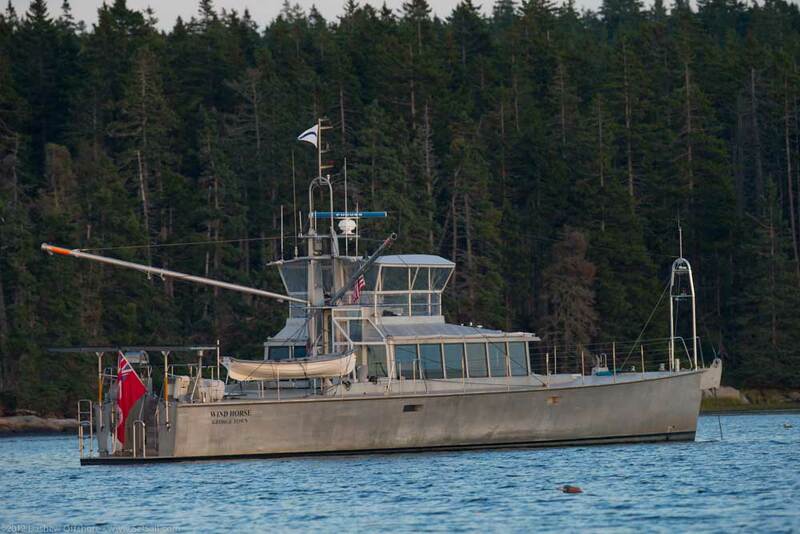 As we learned more about the gear during the summer we added more sensors, to the point where we now are monitoring temperature on a variety of items such as pumps, exhaust system, prop shaft glands, and engines, along with repeating the data previously available on our analog system, depth forward and aft, and the usual navigation and weather info. As we have grown more familiar with the Maretron’s N2K view, the displays, easily modified by the operator, have evolved. 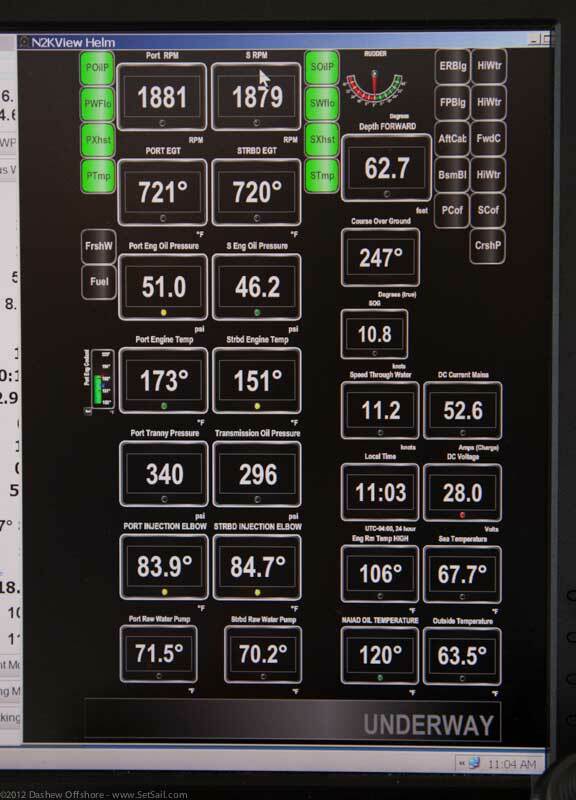 At both the inside and fly bridge con we share the main wide screen monitor now between charting and N2V View. Shown above is an early data layout, this for what we call piloting, i.e. close-in work. Note that depth forward and aft is shown as we now have a transducer tied to the N2K buss all the way aft. 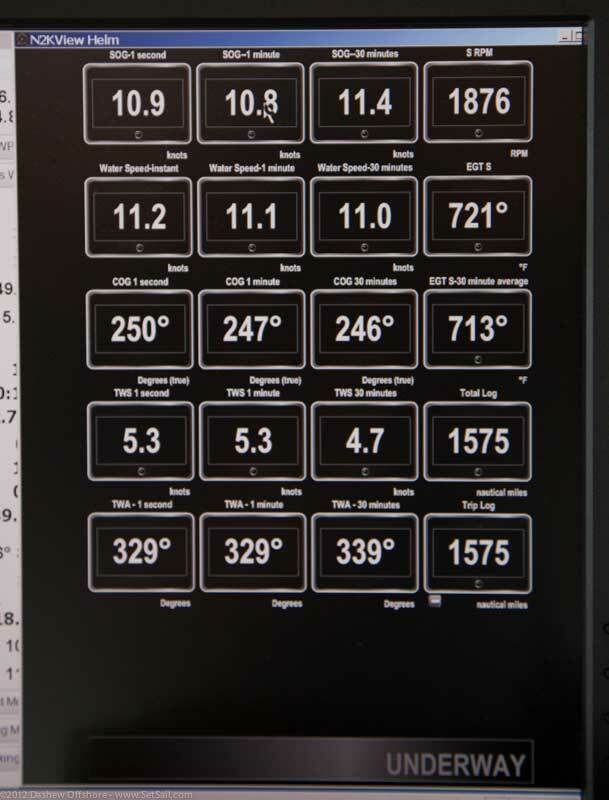 We quickly became enamored with the integration of the iPad into the N2K system, and changed the aspect ratio of the standard screens to where they would fit on the iPad in vertical format. The screen shown above is an off soundings general watch keeping data set. It is also possible to have varying averages for a given item, as an example speed or course. 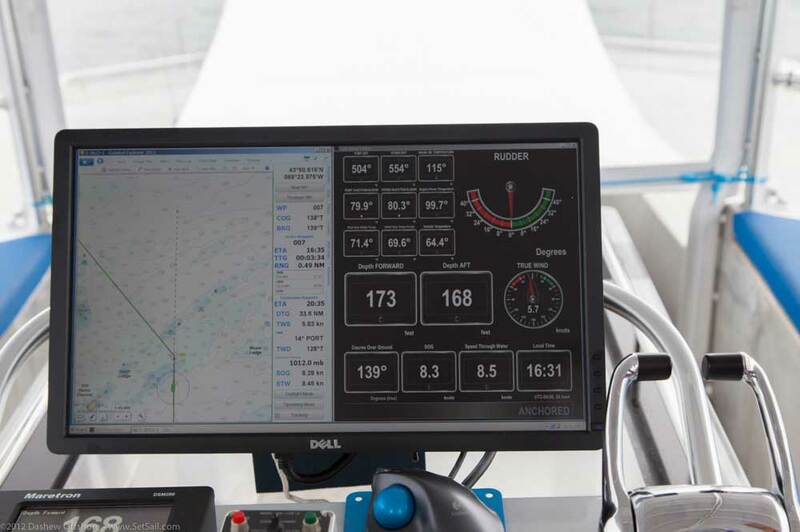 For piloting in close we want instantaneous readings, but offshore it is helpful to know the average over several minutes and maybe longer. 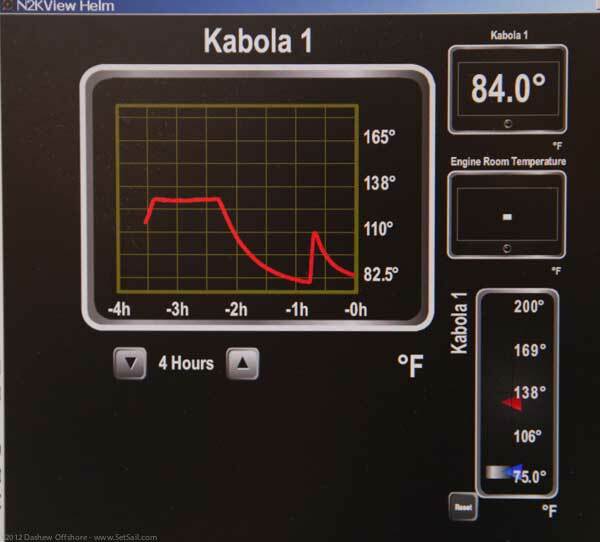 You can also have information pages set up for specific topics, in the case above the Kabola diesel heater. Looking carefully at the photo above will reveal an interesting detail that was the result of a bit of testing we wanted to do for the Wicked FPB 97. Wind Horse is an exceptionally quiet motorboat. 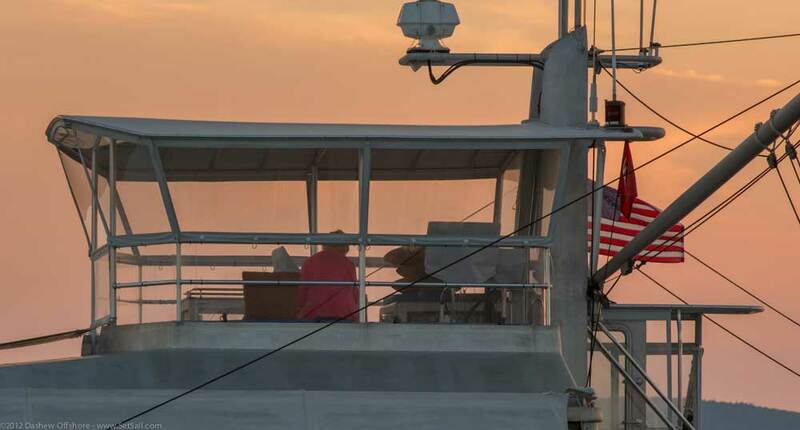 When Bill Parlatore, the editor and founder of PassageMaker magazine did a sea trial with us, he wrote that Wind Horse was the quietest vessel on which he had ever measured sound levels (and this at 10 to 11 knots). We agreed, but after many thousands of hours thought we might do better. This search lead to a series of side benefits for which we are grateful. We started with an underwater exhaust, which in turn required an extension of swim step/boarding platform. We are looking here at one of the 3 ramps ahead of the underwater exhaust that we tested. 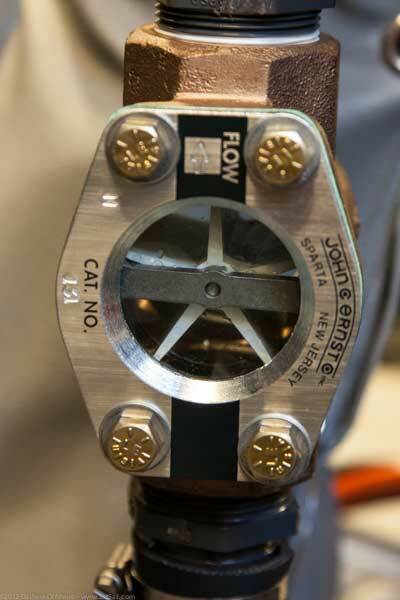 The extension is a meter (39″) long, and offers a series of benefits. The first of which is a cleaner stern wave release, shown here at 10.5 knots. Next, that extension is a better boarding platform, allowing the option of coming up from astern as before, or alongside which is now the norm. There is a bit of storage in the extension as well. The underwater exhaust, now further aft, is quieter and cleaner. The concomitant reduction in exhaust back pressure allowed us to fit mufflers in line where before we had low back pressure vertical (dropping) aqua lifts. 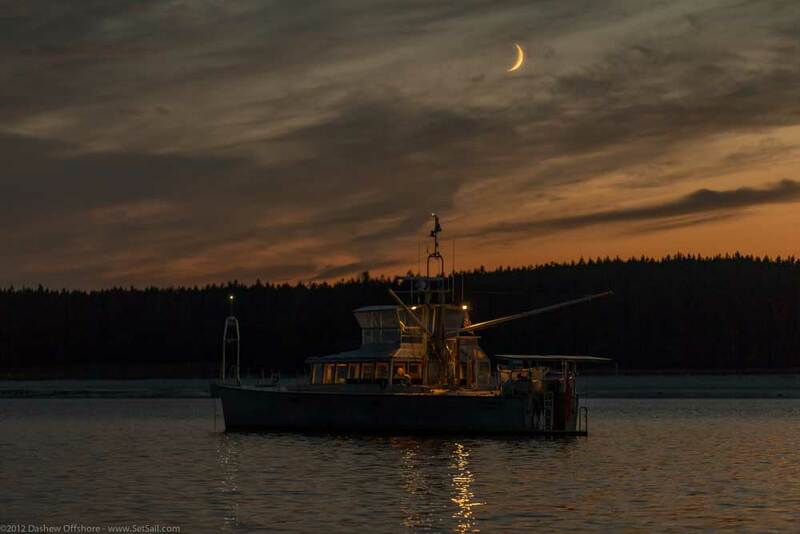 All of which adds up to a quieter boat. The one thing we did not like was the loss of a visual indicator of salt water flow. 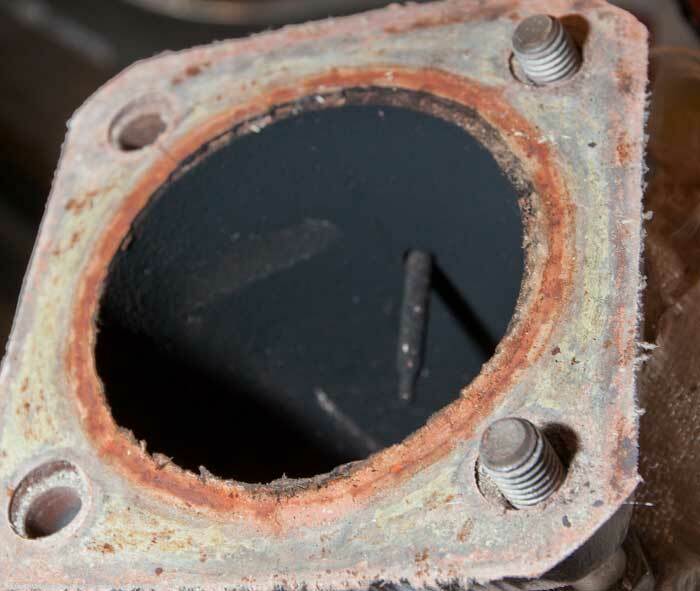 This has been solved with in line flow indicators, backed up by N2K temperature sensors and related alarms on the raw water pump, exhaust injection elbow, and mufflers. These Maretron N2K sensors are accurate enough to show when an impeller has a small tear in several of the vanes. 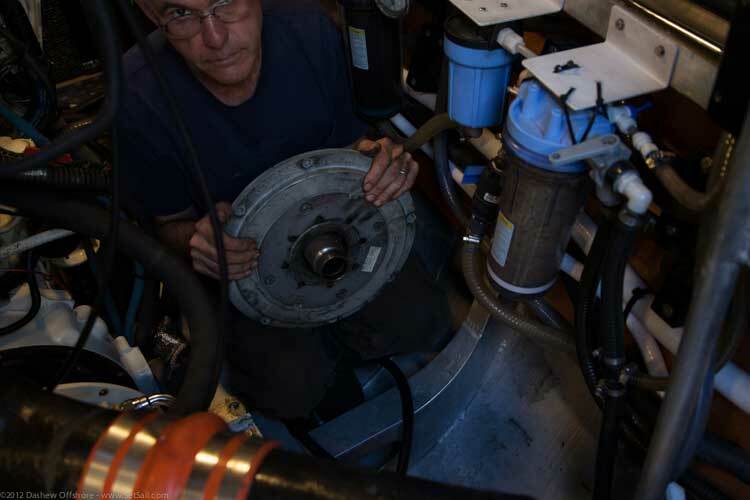 With nearly 6000 hours on the engines and seven years of cruising, we thought it time for a thorough inspection and preemptive replacement program. 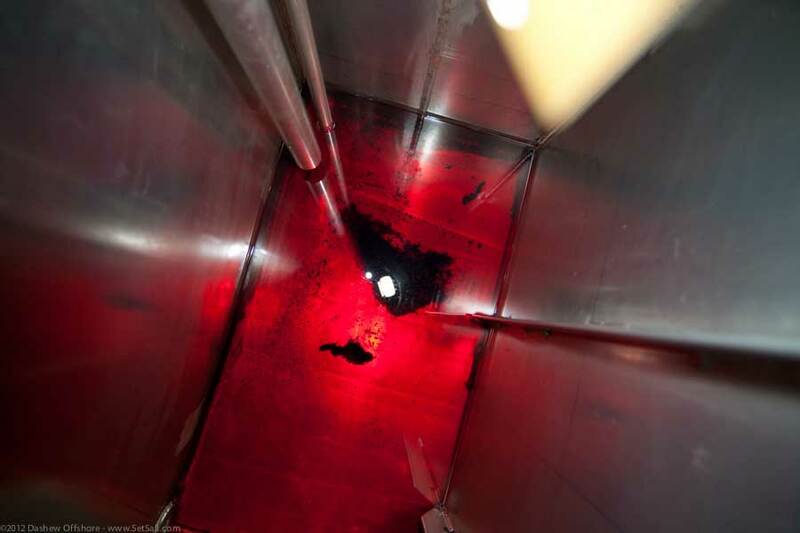 This started with an inspection of the fuel tanks, and cleaning of their sumps, one of which is shown here. Debris and tar build up was minimal. The exhaust system was replaced with a new design, which gave us a chance to look at the carbon buildup, or lack thereof as you can see here. Props were pulled, prop shafts removed, and Cutlass bearings replaced, although wear was minimal. 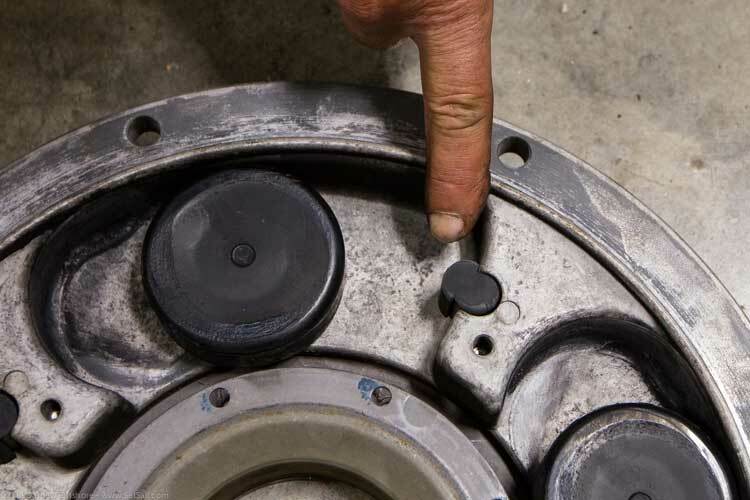 In the process of chasing noise and vibration which became apparent with the quieter engine room, we inspected one of the vibration dampener plates that transmit power from engine flywheel to the transmission. The wear on the low speed dampeners indicated it was time for a change (high speed are fine). This smoothed out the engines at idle. 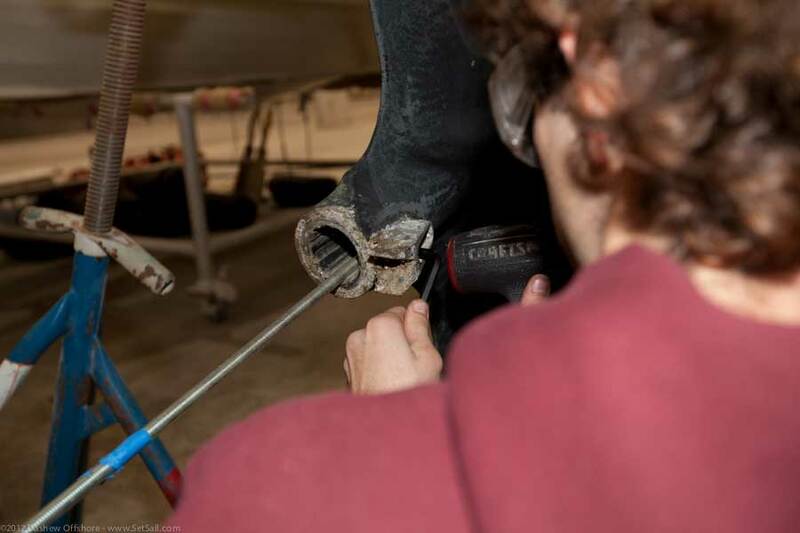 In addition the rubber plumbing parts on the engines were replaced, PYI bellows on the shaft seals changed, much of the salt water hose and almost all hose clamps renewed, turbos sent in for rebuild, alternators checked by Electrodyne, and a long list of other items. 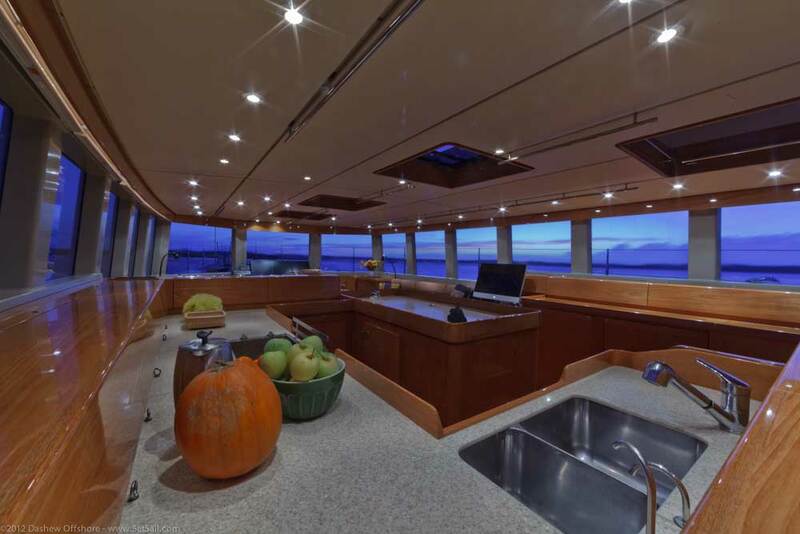 Although our power consumption is quite modest for a yacht that cooks electrically with two big freezers and a huge fridge, we made a small but important change that has further reduced our electrical burn rate. We have a bank of 230VAC Victron inverter chargers. Our 115VAC for small appliances like toasters, hair dryers, TVs, etc. is created with a step down transformer, taking the 230 down to 115V. There are a couple of efficiency issues here. First, the transformer takes power to energize its windings, whether or not it is doing work. Next, the big Victrons are not efficient in producing small amounts of AC power. The answer, which we’ve been using with the FPB 64s since 64-1, is a dedicated 115VAC inverter. This is now installed and allows the 230V inverters to be turned off except when cooking or doing other high power draw functions. The transformer has been relegated to a backup role. Window coverings were originally translucent, with control cords for running them up and down. Two problems: there are a lot of these to operate and the cord control is slow. And in most cases there is too much light let through with the translucent window coverings. These have been replaced by a blackout double cell cordless Hunter Douglas window covering. They are faster to adjust, and have proven to do a much better job of reducing heat load as well as light. Where previously side awnings were a must on bright days, these have now become an option. Our interior ambiance is without parallel. Heating and air conditioning have been upgraded to match. We have installed the most recent generation of Marine Air reverse cycle air conditioners. These have lower starting loads, produce more cooling for the same power draw, and are quieter. The heating coils on the diesel boiler have had their fans changed to quieter models as well. In the case of the owner’s suite, shown here, the fans have been removed from the heater coils and mounted mid-duct. They are now almost totally silent. There are many other minor items that we’ve worked through, that we do not have the time to detail. The goal, as always, is the most efficient, comfortable cruising possible. While we had it good before, maybe the best cruising tool ever, we now have it better. Thanks are due to our many vendors and the folks who helped us to accomplish these tasks. This entry was posted on Tuesday, November 13th, 2012 at 12:00 am and is filed under Dashew Logs, FPB 83. Both comments and pings are currently closed. Did you ever figure out why the stardboard engine runs cooler? The interior shots shows gorgeous wood work! Nope… but thanks for all the suggestions. Where are the microphones, radios, communications sets? On the flying bridge the VHF remote command mic is on a clip under the desk. At the inside conn the VHF remote is fwd, with a second at the desk in the middle of the great room. This latter desk also has the SSB and its mic. I love your boats!!! 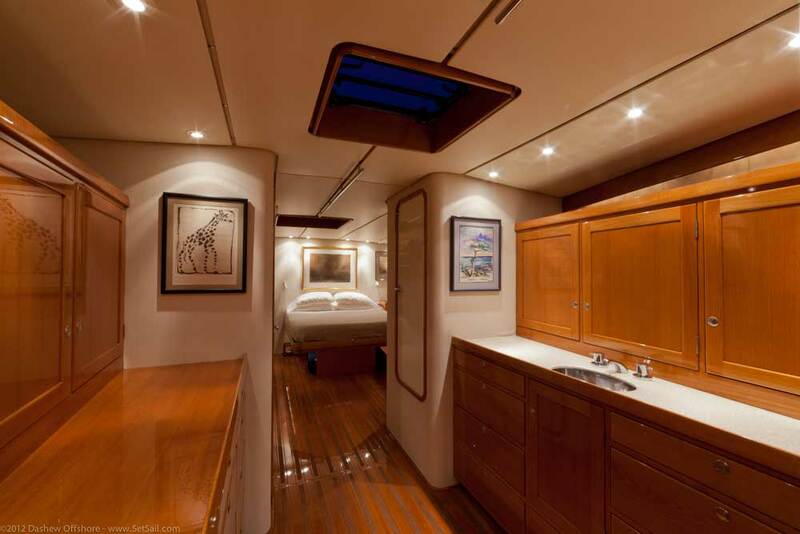 When I design my boat(sailboat) I intend to incorporate some of the features on your boat into mine. 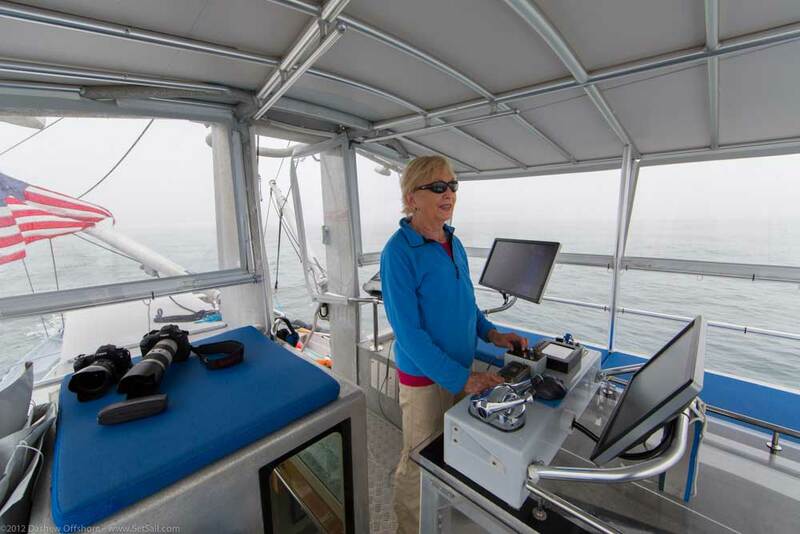 Great shots of the flying bridge – I love the visibility. What a great space. Also the Ocean Race video at the bottom with their x-box in heavy seas is interesting. Not very elegant but effective. The bridge is radical. We’ll have to see if we can adapt the concept to our boats. How quickly/easily can you open the bridge up? Do you need to take the ever clear panels down and stow them elsewhere? I love running from the bridge, but part of that is being in the open air. Fantastic website. Thanks for sharing everything with us. Opening is very quick. Open three zippers, rotate the panels in/up, connect a couple of bungee cord loops to fitting on the aluminum framework. Speaking of the arctic, how is the air/temperature flow in the great room when in colder climates? Do all those large windows create air temp drafts? Just curious, love the boats. There is a draft of the uninsulated surfaces, but it has not been a big deal (we have a very efficient Kabola diesel boiler). Steve, in the photo of the galley counter, behind the pumpkin, there are several attachments sticking out of the counter in front of the storage units. What are they?